Looking for something fun and exciting to make memories that last a lifetime? The opportunity lies closer than you might think. In Lee’s Summit, you’ll find charming boutiques and restaurants, the rhythm of music and the arts and, of course, the curiosity of the history buried in the bricks downtown. With so much to discover, we invite you to create your own adventure and experience the attractions and enthusiasm that make Lee’s Summit such a vibrant place to be. Located less than 20 miles from downtown Kansas City, Lee’s Summit is just a hop, skip and a jump from many top-rated area attractions. We offer easy access to the Royals, Chiefs, Kansas City Zoo, Starlight Theatre and all major Kansas City metro highways. Arrowhead Stadium Make a visit to the home of the Kansas City Chiefs. Ninety-minute guided tours of the press box, Scout Investments Club Level, locker room, field, and the Chiefs Hall of Honor are offered Friday and Saturdays year-round. In addition to hosting Chiefs games, Arrowhead hosts a number of concerts and other events throughout the year. Kansas City Zoo Take a journey around the world and experience diverse habitats, cultures and animals at the Kansas City Zoo. This 202acre nature sanctuary promotes understanding, appreciation and conservation through its exhibits and exceptional education programs, while attracting visitors from around the world. Main Event When you want to let your fun out with family and friends, Main Event is the best and easiest place to head for fun. With state-of-theart bowling, multi-level laser tag, and over 100 games, topped with handcrafted food and a full bar under one roof, Main Event is the ultimate destination for fun. Kauffman Stadium Kauffman Stadium is home to the Kansas City Royals and is just a stone’s throw away from Lee’s Summit. Head on out to the ballpark to see the Hall of Fame, visit the team store for some gear and witness major league fun watching the boys in blue. The 2019 season will open at Kauffman Stadium on March 28. Visit their website for a full schedule of home games. Faulkner’s Ranch Silverstein Eye Centers Arena The Silverstein Eye Centers Arena is a 5,800seat multi-purpose arena in Independence, Missouri. It currently hosts the home games of the Kansas City Mavericks in the ECHL and the Kansas City Comets of the Major Arena Soccer League. Whether it’s a hockey game, soccer game, concert or ice skating outing, there’s no better place for sports, entertainment and recreation than Silverstein Eye Centers Arena! Find food, entertainment and interactive fun all in one place at Faulkner’s Ranch. Faulkner’s Ranch is a 25-acre property that features a banquet barn, picnic pavilion, wild western playground, petting farm and more! From corporate meetings to a Pony Party for a child’s birthday party, it’s the perfect place to host any event. Just 20 miles from downtown Kansas City! Your ideal place to stay in the Kansas City Area. Love to shop? You won’t be disappointed. Lee’s Summit is a dream for the most passionate shopper. Whether you’re into one-of-a-kind finds at local shops or name brands at national retailers, you’ll find it in Lee’s Summit without the traffic and hectic crowds. Basics? Of course! Trends? We have them! Unique finds? Come and get ‘em! WHAT’S TRENDING... TOP LEE’S SUMMIT SOCIAL MEDIA POSTS With new attractions popping up all the time, often our locals have the best beat on the latest and greatest Lee’s Summit has to offer. We toured Instagram to find what people are posting in Lee’s Summit. So, here’s a look through their eyes, or should we say, lenses! WANT TO JOIN IN ON THE FUN? Follow @LStourism on social media and tag your photos using #LStourism. mixing is all the rage! bring your friends to mix and chill! Lee’s Summit sets the table to satisfy any palate. From quaint coffee shops to mouthwatering barbecue and specialties, you won’t go hungry. Need to submit a restaurant listing? Visit LStourism.com to submit your business today! Discounted Rate applies to LS Residents. Proof of residency required. LS mailing address does NOT guarantee residency. NATIONAL ACT IS ON THE WAY! 897 NE Bluestem Dr • Lee’s Summit, MO • 64086 • 816-969-1500 Visit RockTheAmp.net for more! ARCHERY The Landahl Archery Range hosts several state and national tournaments and consists of scenic shooting trails nestled into the woods with abundant wildlife. A wheelchair accessible practice range also is available. BEACHES AND LAKES There’s no need to travel to the ocean to experience the fun of playing in the sand, building a sand castle or splashing around in the water. Longview Lake and Blue Springs Lake offer beach facilities for patrons looking for a unique recreational experience. Coming this summer to Longview Lake Beach: Rowdy Ribbits Water Park. Open Memorial Day weekend through Labor Day, these unique Jackson County gems are staffed by highly trained lifeguards and offer a safe environment for visitors of all ages. Season passes, group rates (20 or more with 48 hour notice) and birthday party packages are available. 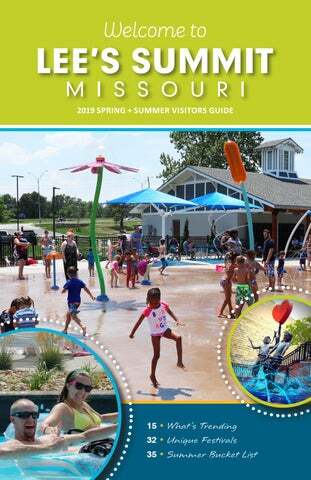 For more information about Jackson County Parks + Rec beaches, please call 816.503.4878 or visit makeyourdayhere.com/beaches. CAMPGROUNDS Dating back to 1922, Jackson County has one of the oldest Parks departments in the U.S. Over the years, the park has expanded to 21,000 acres featuring 238 camp sites with campers from around the country. Sites are available on a first-come, firstserved basis with attendants at each site. EQUESTRIAN PARK Located on the south end of Longview Lake, the Longview Equestrian Park is a multi-use area spread across 54 acres, perfect for riding, jumping and showing. The site hosts weekend saddle and carriage competitions and is equipped with a Lake Jacomo lighted show area, cross country course, carriage obstacle course and stalls for 115 horses. MARINAS AND BOAT RENTAL Lake Jacomo, Blue Springs Lake and Longview Lake have full service marinas offering pontoon rentals and all of the gear you will need to make your day at the lake complete. Lake Jacomo Marina also offers fishing boats, paddle boats, kayaks and canoes. Call or go online at makeyourdayhere.com/marinas. Lake Jacomo – 816.795.8888 Blue Springs Lake – 816.795.1112 Longview Lake – 816.966.0131 RADIO-CONTROLLED AIRFIELDS For the radio-controlled airplane enthusiast, Jackson County has three radio-controlled airfields. Fleming Park features a paved airstrip, while Longview Lake Park and Blue River Parkway offer grass airstrips. All airfields are open to the public and supported by local flying clubs. SEASONAL ATTRACTIONS | Unique Festivals SMOKIN’ ON THE SUMMIT SMOKIN’ on the Summit BBQ Competition is a Kansas City Barbeque Society sanctioned competition held annually in Lee’s Summit. This year’s event will be July 19-20 at Unity Village. The event is a state championship qualifier with all teams competing for placement into the American Royal BBQ. Follow along on Facebook for the most upto-date announcements and details: facebook.com/smokinonthesummitbbq/. Climb the ropes course at Lea McKeighan Park. Cool down at the Miller J. Fields Splashpad. Take a nature hike at Unity Village. Catch a movie at B&B Theatres. Visit the downtown Lee’s Summit Farmers Market. Enjoy local barbecue at The Filling Station. Race family or friends in go-karts at Paradise Park. Take a painting class at Got Art Gallery or Pinot’s Palette. Enjoy one of Lee’s Summit’s largest annual festivals, Downtown Days, June 7-9. Make a splash with the whole family at Summit Waves water park. Spend the afternoon wine tasting at Stonehaus Winery. Get inspired during Fourth Fridays in downtown Lee’s Summit. Enjoy a tea party at Henry’s Antiques and Tea Room. Paddle board at Legacy Park. Enjoy Friday night Music in the Park at William B. Howard Station Park. Check out the Lee’s Summit Historical Society & Museum. Take the kids for ice cream at Poppy’s Ice Cream Parlor. Explore unique shops in downtown Lee’s Summit. View detailed map of downtown Lee’s Summit on next page. Downtown Lee’s Summit, a Great American Main Street, boasts locally owned specialty shops and an eclectic array of casual and fine dining on the historic bricks of the central business district. Downtown is a must for those looking for shopping, entertainment and historic character. From boutique clothing and accessories, to home furnishings and specialty items, you’re sure to find a new treasure. 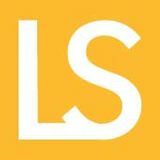 Visit downtownls.org to stay up-to-date on all downtown events or follow along on social media. Do you have a community event to share? Add community events for free at LStourism.com. I don’t see my business? Need to submit your business to be added to our listing? Visit LStourism.com and submit your business today!